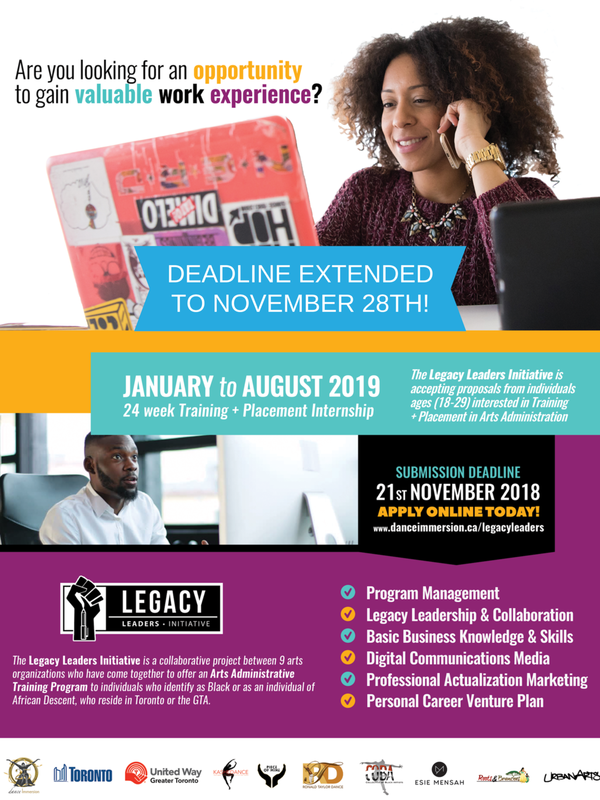 The Legacy Leaders Training Initiative is accepting submissions from individuals ages (18-29) interested in Arts Administrative Training + Placement. This initiative is a collaborative project between arts organizations (see below) in Toronto, who have come together to offer an Arts Administrative Training Program geared towards individuals who identify as Black or as individuals of African Descent, residing in Toronto or the GTA. This program is based on partnerships between arts organizations and the public sector. Our objective is to help build and support business-arts administration capacity; whilst, creating a platform for emerging arts administrators to gain practical experience. Participants will be immersed in an experiential learning environment while receiving marketable arts administrative skills. This collaborative training program will be a hybrid between a traditional class room setting and hands on-learning. Participants will be required to commit to approximately 87 hours, as the program has six integrated modules that run over two semesters. · What is Legacy Leadership? Application is open to young adults ages 18–29 who identify as Black or as an individual of African Descent, who reside in Toronto or the GTA. · Have an interest in working in the Arts. · Can make an 8 month commitment to approximately 87 hours, as the program has six integrated modules that run over two semesters. · Applicant is familiar with Microsoft Office. · Willing to commute for placement. DEADLINE EXTENSION: Applications should be submitted to legacyleaders@danceimmersion.ca before midnight on Wednesday November 28, 2018. · Optional but not mandatory: A fun video highlighting who you are, skills, and why you believe that you are a good candidate for this program. After all applications are received and meet the eligibility criteria, applications will be reviewed by a committee who will conduct interviews before the final selection. Successful applicants will be notified by December 5, 2018. 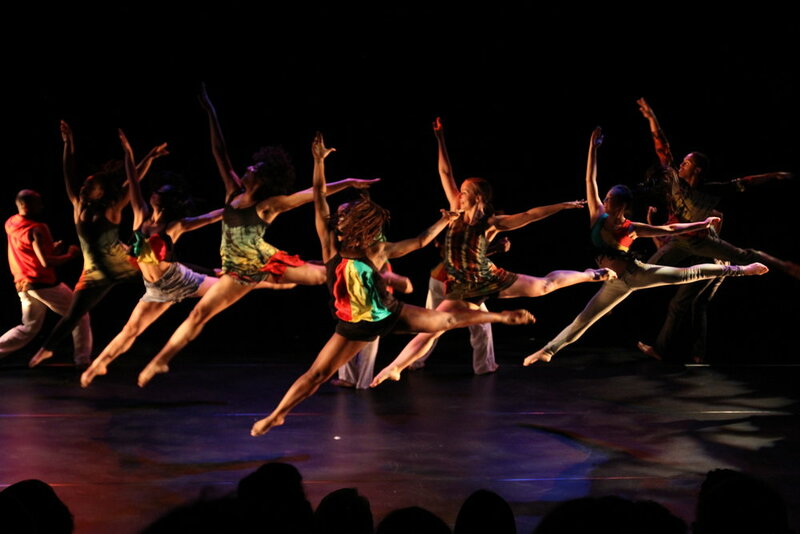 Esie Mensah Creations is a fresh new dance company committed to creating quality work that reflects her community. Esie (choreographer/dancer/teacher/model) is the 2017 100 Black Women to watch in Canada, 2015 recipient of the Cultural Promotion award from the Ghanaian-Canadian Association and the 2014 Black Canadian Award Winner for Best Contemporary Dancer. She began creating work in 2013 but the journey has become more serious and focused within the last 3 years. Esie uses her own unique style of Afrofusion (movements rooted in Traditional and Contemporary African, Commercial, Urban and Contemporary styles) to tell her stories. EMC is committed to speaking the stories that reflect the community; belonging, identity, shadeism and coming into your own. Her commitment to telling our stories promotes conversation. A conversation that is difficult to have but necessary for our healing. NGOMA is an ensemble of young performers who capture the essence of their cultural heritage through drum with a distinctive new vibe. Ngoma is committed to honoring their ancestry through the dynamic presentation of drum pieces that educates, empowers and embraces the majesty of African Heritage. PIECE of MINE Arts (POMArts) presents bold works created by Black performance artists, as well as youth programming and education workshops designed to explore African Canadian narratives. Based in Toronto, Ontario, the organization was founded in 2013 by theatre practitioner Natasha Adiyana Morris to platform works-in-development. The collective forms opportunities to make space for substantially more voices and stories that celebrate the vastness of Black culture. 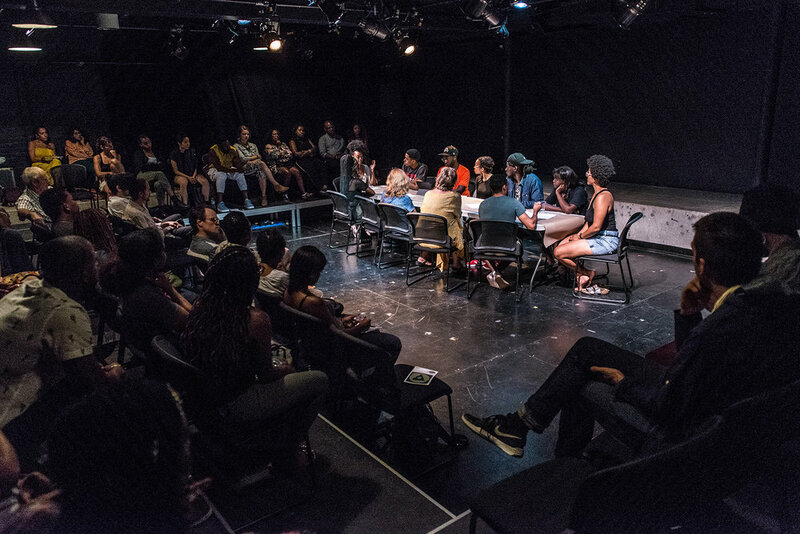 Collaboration and curation drive POMArts to produce thoughtful and quality programming including the annual PIECE OF MINE Festival, Black Men in Theatre, and the Living Black Genius youth program. Over 150 participants have been featured by the festival thus far. Free youth arts programming and tickets are provided to underserved groups across the G.T.A. Ronald A. Taylor is the Artistic Director of the Toronto-based company Ronald Taylor Dance (formerly known as Canboulay Dance Theatre) founded in 1993. After leaving his homeland of Trinidad and Tobago, the birthplace of internationally acclaimed dance pioneers Geoffrey Holder and Beryl McBurnie, Taylor embarked on a journey to pursue his dream and enrolled in the renowned Juilliard School, and its dance division in New York. Under the watchful eye of Héctor Zaraspe, international ballet master and private teacher to Rudolf Nureyev and Margot Fonteyn, Taylor excelled and graduated with a BFA in Dance. 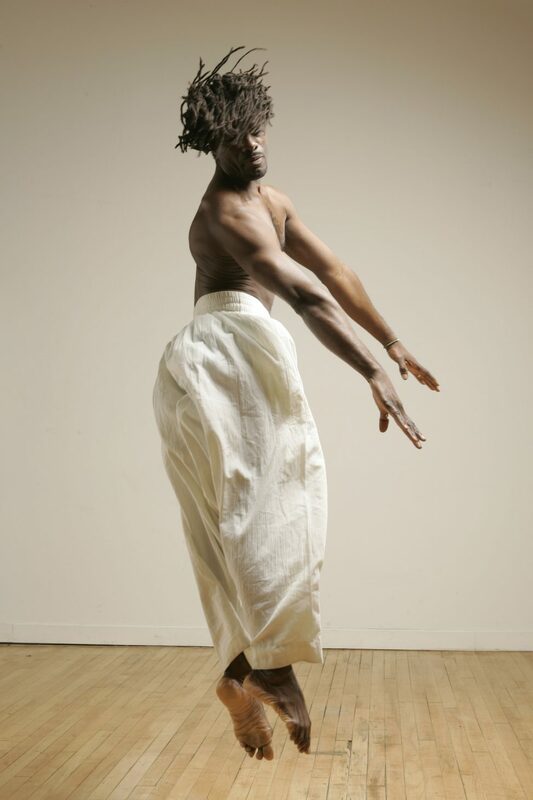 Taylor’s talent was first nurtured by another trailblazer and choreographer, the late Astor Johnson of the innovative Repertory Dance Theatre (Trinidad) which strengthened the path for awards recognition following his graduation from Juilliard. His stay with Dance Theatre of Harlem (DTH) afforded him two prestigious awards, the DTH Scholarship Award and the Maxwell and Muriel Bluck Scholarship Award. Taylor moved to Canada in the early ’90’s and emerged as a leading force in black dance. Remaining true to his Caribbean roots, his work fuses Modern with Folk, and traditional Ballet in a distinctive style which Taylor best describes as Contemporary Caribbean. One of his best known works to date, includes the beautiful and memorable MASS, a full length ballet with commissioned music by South African- born, award winning composer and advocate for cultural diversity, Bongani Ndodana-Breen. A firm advocate for education and personal growth, Ronald has successfully pursued a Master of Arts degree at York University. In his capacity as dance educator, Taylor taught at York University Faculty of Fine Arts and at designated school arts programs across Ontario, Western Canada, Belize, USA and parts of the Caribbean. Since 2014, Taylor has served as Rehearsal Director for two of the leading dance companies in the Diaspora. He is a valued member of the Artistic Team for Ballet Creole and Kashe Dance and in this capacity assumes a dual role of mentor, dramaturge and rehearsal director. Taylor was born to dance and to push the boundaries of choreographic experiences. He continues his journey with drive, passion and commitment. Roots and Branches was born in 2011 as cultural arts program specializing in dance for Afro Diasporic children, youth and families. The program started in the Malvern Community and has expanded to satellite programs in Brampton, and Burlington. Roots and Branches specializes in teaching, learning, presenting, preserving, creating and developing the dance culture of African, Caribbean and Canadian Diasporas. The group focuses on cultural education, dance skill, technical development, story telling, community development and mentorship. As a performing group, the R&B team has won many competitive awards, including the 2017 GTA Got Talent Best Dance Group Award, the 2016 Praise Him Dance Festival Best Junior and Senior Praise Dance Duet & the 2016 and 2015 Junior Folklore Dance Festival awards for Most Outstanding Performing Dance Company, Best Soca/Calypso Group 12 & under and 2015 Most Entertaining Group. Roots and Branches exists to create safe, inspiring encouraging black positive spaces to explore life and build legacy through dance and culture. The program is directed by Tamla Matthews.